So here I am, precisely thirty-two hours after my last post, the dreamy escape to Portland already safely tucked into the past. I was so excited for this little getaway that I actually got nervous as we drove out of town, because everyone knows that when a couple is that happy to leave town–and everything seems perfectly right with the world–they end up dying in a tragic car accident, leaving their children orphans to be raised by an indifferent distant relative. That, however, did not happen. And I’m glad, because one more day on this earth meant that I got to go to Voodoo Doughnuts. Have you ever stood in line for forty-five minutes to get a doughnut? Neither had I, until this morning. The real problem was that by the time we realized we were going nowhere, we’d invested ten minutes of precious wait time, and no way were we starting over somewhere else. After fifteen minutes, the formerly friendly weather became my enemy as that cold spring wind blew straight through my hoodie into my now growling stomach. We waited. And waited. About every five minutes, a couple of lucky souls would emerge from the front door with their confectioned bounties heaped in a pretty pink box that was ridiculously mismatched with the grunge vibe of the joint. I’m thinking the color was probably an unfortunate by-product of adamant insistence on 100% recyclable, organic, sustainable materials in which to house their precious doughnuts. Whatever the reason, those Pretty Pink Boxes did not belong at Voodoo Doughnuts. Period. We kept waiting, huddled together against the cold like a pair of desperate refugees. Rather than facing death on one side and starvation on the other, however, we were instead sandwiched between some sort of alternative high school outing in front of us and a group of young local thespians behind. We continued our slow march toward the front door as one of the “actresses” behind us began waxing poetic about religion and coffee. All I can say about her dissertation is that never will I recover the ten minutes of my life that I spent listening to it. The slow stream of satisfied customers continued to trickle out the front door, their faces lit up with the smug, secretive confidence of those who have been admitted to the Inner Room. I found myself wondering if this was the expression Katie Holmes wore after Tom Cruise inducted her into the executive boardroom of the Scientology cruise ship. I thought about Tom and Katie for a long time. Wondered how they were doing. But then I was done thinking about them and I went back to being hungry and cold. And so it was, after a piece time that moved more slowly than the Willamette River, we were upon the front door. Like Jean Val Jean before he committed his fateful crime, only a pane of glass separated Me-From-Bread. I could smell the frying fat; I could taste the crystal sugar. And suddenly, without fan or fare, the door was opened. A curtain was pulled back and we were ushered into Oz. And Oz it was, my friends. Oz it was. Think twenty bodies crammed into two hundred dimly lit square feet. Think a long counter manned by two teens–a boy and girl–who were, by all appearences, apprenticing for their future roles as The Man Who Didn’t Make it to San Fran and The Deliberately Unattractive Woman (see pp. 3, lines 2-3). Think of the thick stench of cigarette smoke and body odor that surely violated codes of, if not health, at least basic personal hygiene. But most of all, think of the doughnuts. You know, I don’t really see how that bit of information is relevant to the conversation at hand. Let’s move on. We sailed out of the shop conquering heroes, pleased to see that the line was now twice as long as it had been when we were in it (we’re not above relishing in others’ misfortunes.) Derrick held the Pretty Pink Box high above the heads of the trodden masses who looked up at us with hungry eyes. I graced them with a benevolent smile that said: “Be patient, little ones. Your time will come. Yes, your time will come.” And with that, we were off to Saturday Market. In the two minutes it took to walk there, we managed to inhale all six gargantuan doughnuts. They were geeoood. e Willamette: In the name of all things recyclable, I am now a member of the Voodoo crowd! Never again would I be caught in a Wal-Mart. Never again would I coupon at Walgreens. Cloaked with this new identity, I smugly made my way downtown where I was sure my funky and fancyfree essence was palpable to each person I passed. That is, until I stepped into Anthropologie. My funky and fancyfree essence disintegrated the moment I stepped into Anthropologie. Had you let us know that you were going to be in Portland (yes, I'm being smug),Jason and I would have let you ride in the coattails of our coolness since(I'm sure this will come as no surprise) we are both Voodoo veterans ourselves. But honestly Jen, I think you are giving Voodoo and it's patrons way too much credit because in the end a donut is still just that…a donut… and raunchy is still raunchy. If you are in Portland again, (and you happen to let us know), we will take you to a place much more worthy of your calorie allotment…Papa Haydn's…there may still be a line, but certainly not the "stank". P.S. great post…you really truly make me laugh. P.S.S. I noticed you are reading "Prize Winner…". I just saw that movie…really good!! Jennifer-I have to confess that I actually cut and pasted your email (only saying you were my cousin) and sent your post to a couple of my friends that know voodoo doughnuts. They loved your story. Thanks for sharing it. Nanc, you were so in tune–I'd actually written it when I got your message. Thanx! This post way way too long though–my goal is to become normal and write normal length posts like normal people do.Amanda–so glad you know Voodoo! There must be something similar in Olympia, though. How are you guys? 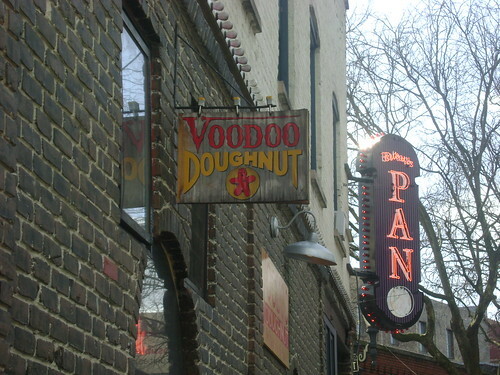 We try to make it to Voodoo whenever we go to Portland. My friend told me that the first time she went whenever someone would walk out with their doughnuts they would raise it above their head and everyone in line would cheer. My favorite is the maple-bacon bar. Jen, You followed my advice and blogged about voodoo donuts! You like me. You really like me. :)BTW, loved the blog. Ah Jen, you are a master with words! Now, your taste in food – that's another story; I'll have to agree with G about the doughnut! Love your prosaic meanderings!!! Thanks for sharing! Another great start to my morning, Jen. 🙂 Maybe you should start posting every morning and I'll read that instead of the paper- it's much more entertaining. 🙂 BTW- that "doughnut" looks disgusting!! My favorite part is the fact that the 2 of you scarfed down 6 donuts in a few minutes flat. That's impressive. A crunch berry explosion donut?! Who knew that existed?! Hmm…Jared might actually go for that one, too. they sound sooo good! i think places like that purposely make customers wait outrageous lengths because it only makes their food that much more desirable and legendary. it works. 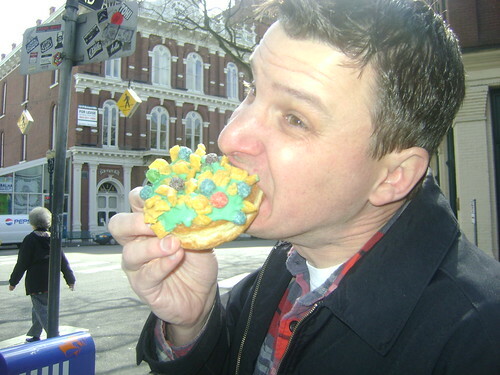 Hard to look good when trying to wrap your mouth around a giant doughnut covered in Crunch Berries! Haha!! so glad you experienced Voodoo! Perhaps for spring break I'll have to make a road trip to Portland because it's been 5 years since I've tasted some mango voodoo goodness on my tongue. And with finals this week that sounds pretty tasty! Glad you had fun and survived without leaving orphans! That place sounds fantastic. But not so much the wait. If nothing else, you were supplied with fantastic material for your post. I was afraid for a moment that you were going to say that there were no doughnuts left after the sheer size of the crowd. Whew. Glad you got a few super yummy treats. p.s. Costco guy could be in management. I've never really checked out his name tag aside from reading his name. His biceps are too distracting, and they are, after all, in close proximity to his name tag. No competition there. Sigh.